“Where, No One Knows” is LIVE! I’ve been away for awhile, and while I wish I could say it was because I was toiling diligently away on my NaNo project, such wasn’t the case. I completely failed to manage my time between writing and working a job in retail, and as such was unable to complete the required 50,000 word goal. Boo hoo. There. I’m over it. Moving on! I am pleased to announce, however, another small victory. The other novel I’ve been chipping away at for the last couple of years is now available to purchase through Createspace and Amazon. Right now, it’s only available in paperback, but a Kindle version is incoming once I fix some of the formatting issues that came with converting the files from Createspace. So, go on! If you’re looking for a light-hearted, pulpy adventure to curl up with this holiday, go check it out. And if you do, let me hear what you thought and if you have any suggestions to help improve future projects, let me know. I’m always open to constructive criticism. “The Blackwood Empire is facing a bit of an energy crisis. Everything runs on steam, and the fuel for the fires, an alchemical substance called Blackwood, is running out. 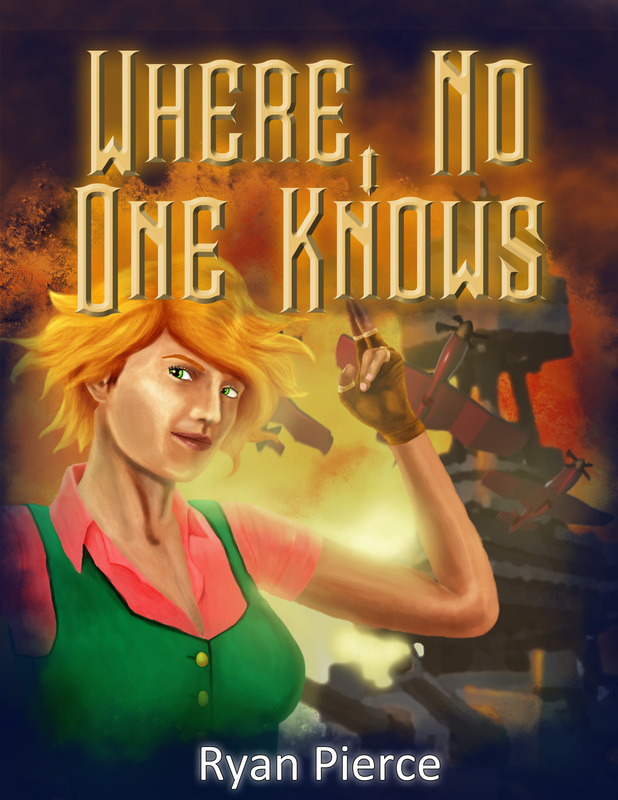 Only the brilliant scientist, Sir Rigel Rinkenbach, knows the secret, and he’s gone missing! He’s been taken to Where, No One Knows, a massive prison ship that patrols the Imperial seas. There’s only one way onto Where, No One Knows, and only one way out. It’s a delicate job requiring finesse, and in the Blackwood Empire, cutthroats are a dime a dozen. Pixie Sinclaire, former agent provocateur, outclasses them all. Pixie and Rigel have a rocky past, but the flame persists. When the NorEastern Nations hire her to infiltrate the impenetrable floating fortress, Pixie takes it as a challenge and opportunity to set things right. Once on the ship, things quickly go south. Pixie must deal with a jail break led by a charismatic political prisoner hoping to use Rigel in the creation of an independent nation state, a pair of air pirates looking for revenge on Rigel, and others who stand to lose everything should the secret of Blackwood ever reach Imperial shores.